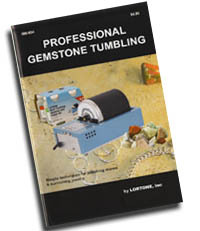 Here are just a few of the lapidary supplies we offer: Optivisors (low vision aids for the visually impaired) magnifiers, lapidary tools and supplies for your business or your hobby. 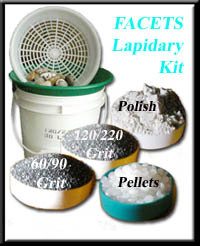 < - - The Complete Lapidary set-up package contains all the necessary supplies to grind and polish 24 to 30+ pounds of rock (excellent for tumbling agate, jasper, petrified wood, etc. ): 3- step stone finish kit (2 lbs. each of the following, course & medium grits, plus tripoli polish). Plus you will also receive the lightweight yet durable separating *screen (as described below), which is made of high density polyethaline to (fit any 3½ or 5 gallon bucket - 11½" diameter), and ½lb. pkg. of plastic pellets. In Stock shipping weight 9 lbs. Buy it NOW and SAVE!. Optional Add on...Silicon Carbide 500 and finer grit a Pre-polish (used as the second phase for the vibratory tumbler). May be needed for rotary tumbling, to bridge the gap between 120/220 and polish for the finishing of some materials such as apache tears and other crystalline materials. 2 lb. pkg. In Stock shipping weight 2 lbs. $12.00. Buy it NOW!